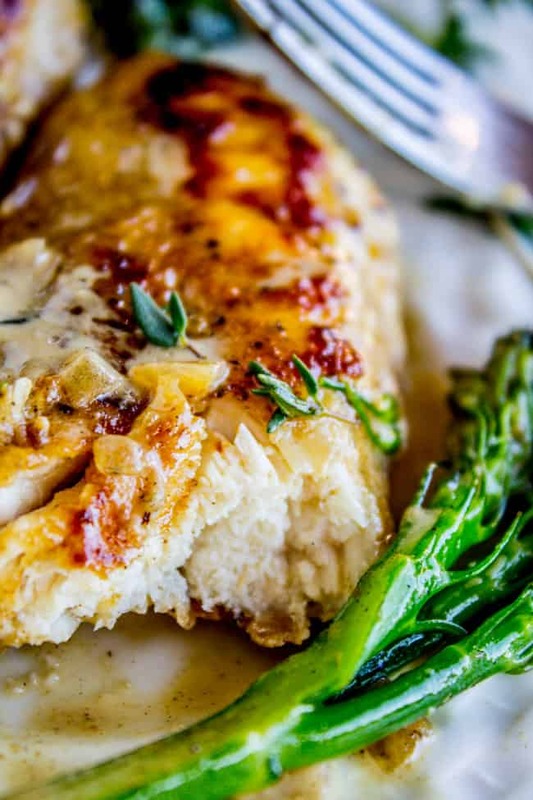 This easy pan-seared chicken is a great weeknight dinner! It seriously tastes restaurant quality. 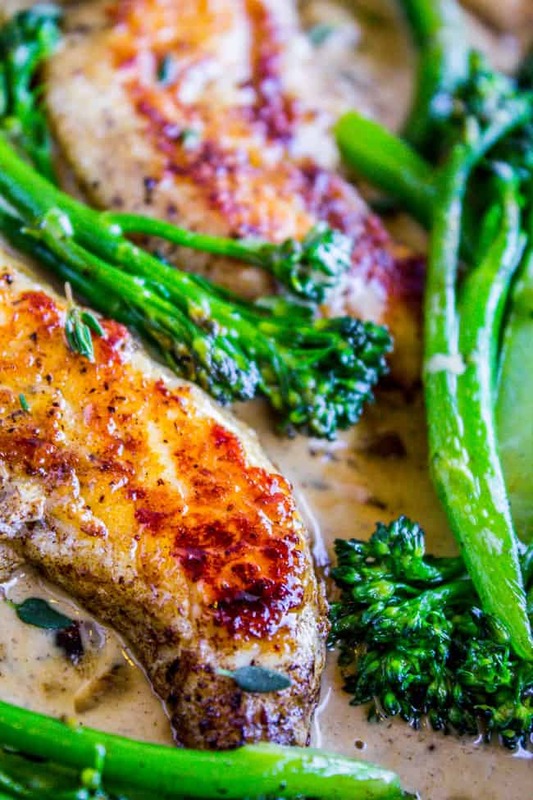 The creamy mustard sauce compliments the broccolini perfectly! One of my friends, who is just a couple weeks more pregnant than I am, told me that she’s like regular size pregnant, and I’m like “fun size” pregnant. Here’s the most recent picture I could find of myself. Does this look FUN SIZE to you? Or anything involving the word fun?? If anyone should be writing a cookbook, it’s Amy. She’s mastered the art of delicious dinners on the go. She’s got two busy kids who won’t take drive-through for an answer (well. Maybe they would, but she won’t!) 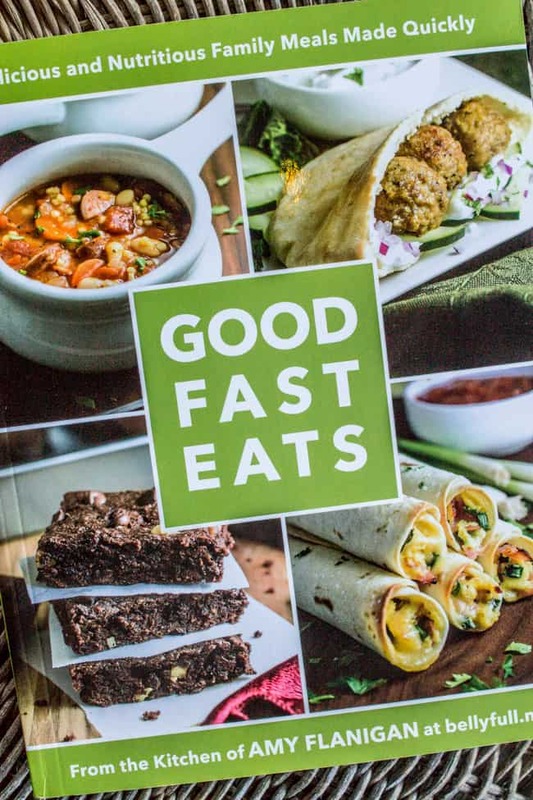 and she’s compiled her favorite go-to meals in a truly awesome collection. I’m so proud of her! 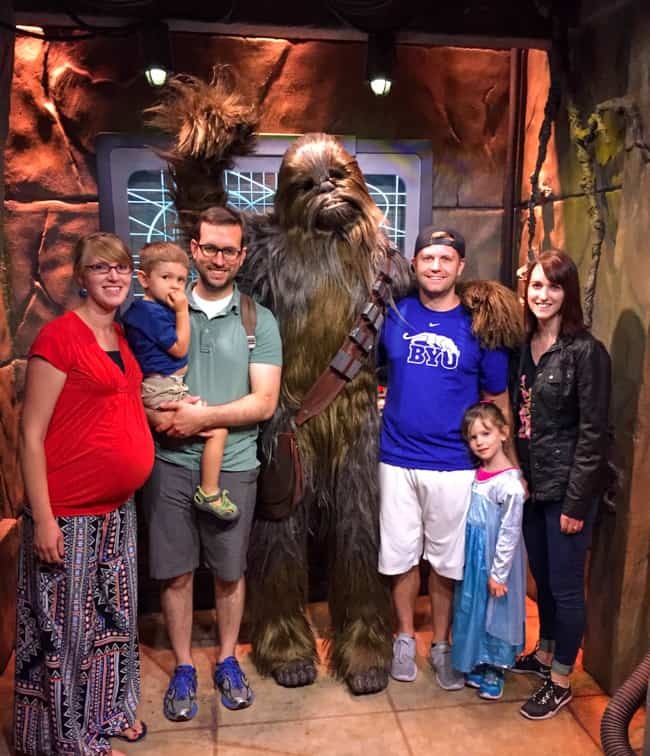 Last week we made the 7 hour drive home from Disneyland and pulled up to the house a little before dinnertime. Of course there was hardly any food in the fridge, but Amy’s new cookbook was sitting in my mailbox and I started flipping through it. I saw her recipe for Easy Ground Beef Stroganoff and happened to have all the ingredients, so I threw it together in less than half an hour. It was delicious. So I really do mean it when I say the recipes Amy brings to the table are easy and fast, and often use staples so you don’t even have to run to the store. Lucky for you this one’s on her blog, not in the book, so you can get the recipe here. I know that photo above is just making your mouth water…ha. I swear it’s delicious. 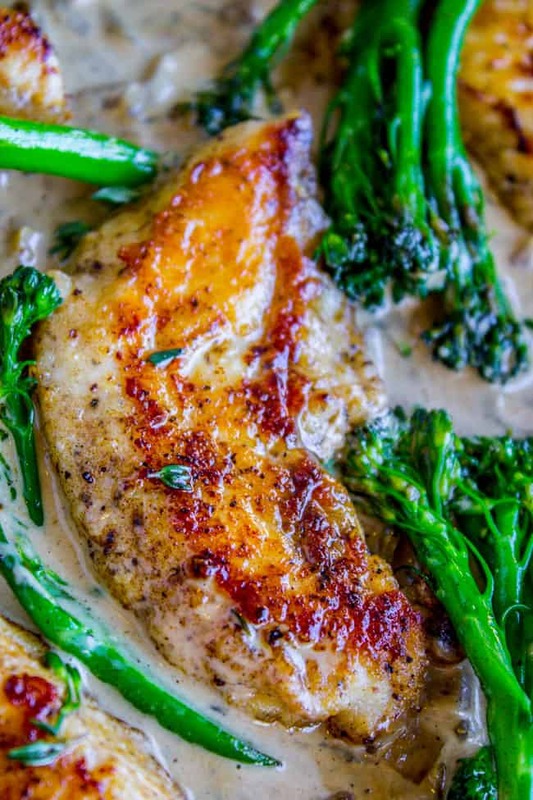 I decided to make her Chicken with Creamy Mustard and Thyme Sauce from the book, but decided last minute to add broccolini and double the sauce. (Any excuse to double the sauce, amiright?) It turned out AH-MAY-ZING. So much flavor! Have you ever made broccolini? I don’t know why it’s not more popular. This was my first time cooking it at home and now I’m wondering why. It’s delicious and super easy to throw together. Just like broccoli, it tastes best when blanched, which is a fancy way for saying “boil for a couple minutes.” I guess the difference is that you have to be really careful that it really is only a couple minutes–2 to be exact. Overdo it and you will get mush instead of crisp-tender awesomeness. Have your timer handy! I can’t recommend Amy’s book enough. If you want to read more about what it’s like, visit her page about the book here. If you want to buy the book you can get it here. Congrats Amy! You’re published! If you make this recipe, share it on Instagram using the hashtag #TheFoodCharlatan so I can see it! I love that. Preheat your oven to 170 degrees F, or the "keep warm" setting. Sprinkle the flour over the chicken (or dredge it on a plate) to get them coated in flour. In a large saucepan, heat 2 tablespoons olive oil over medium-high heat. Add the chicken, but don't crowd the pan; you want it to sear not steam. Do it in batches if your pan isn't big enough. Sear the chicken for 4 minutes; flip and cook another 2-4 minutes, until cooked through. Add more oil to the pan before flipping if it is dry. Transfer the chicken to a sheet pan or other oven safe dish and put it in the warm oven. Prep the broccolini: trim about 1 and 1/2 inches from the bottom stems, and remove any leaves. Slice any larger pieces lengthwise so they are all a similar size. When the water is boiling, add the broccolini all at once, cover with a lid, and set a timer for 2 minutes. Add the shallots to the hot pan over medium high heat. (add a bit more oil if necessary) Saute for 2-3 minutes until soft. Stir in the chicken broth and thyme sprigs. Bring to a boil and then simmer for 3 minutes. Stir in the cream and mustard. Simmer for 5-6 minutes, until the sauce has reduced and thickened some. Remove from heat and discard the thyme stems. 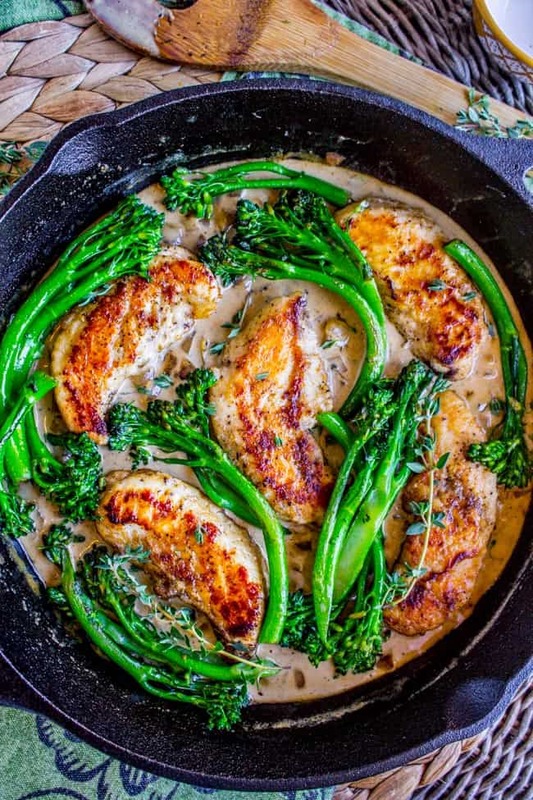 You can either add the warm chicken and broccolini to the pan or serve on a platter with the sauce over the top. This would be great served with salad, bread, roasted potatoes, etc. 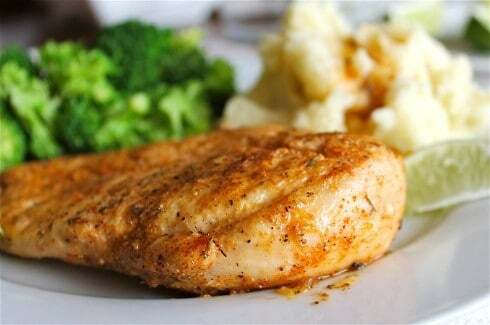 *If you can't find chicken tenderloins (they are in the frozen section) buy fresh thin-cut chicken breasts. If you can't find that, then be sure to pound your regular chicken breast so that it sears easier. ** I always use water and Better Than Bouillon. So easy to keep on hand in the fridge! Source: this recipe is adapted from my friend Amy’s amazing new cookbook, Good Fast Eats! 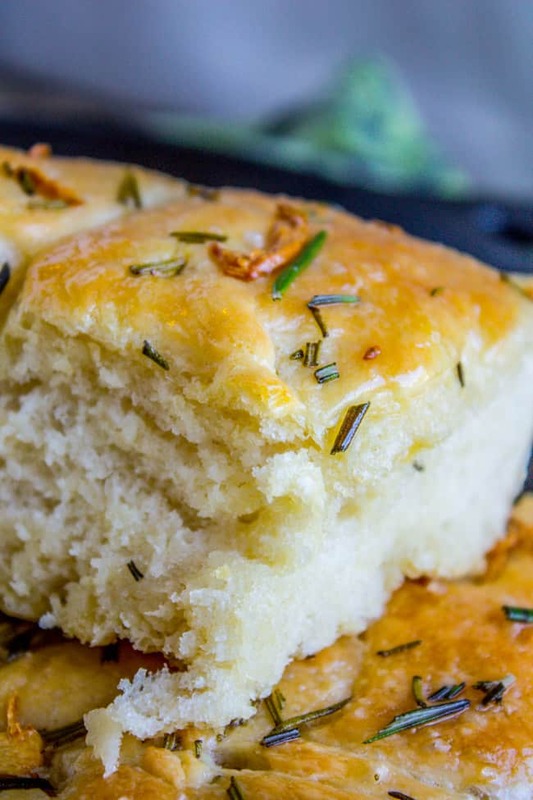 This Garlic and Rosemary Skillet Bread that I just posted would be a great side dish for this meal! Other quick chicken recipes from The Food Charlatan! 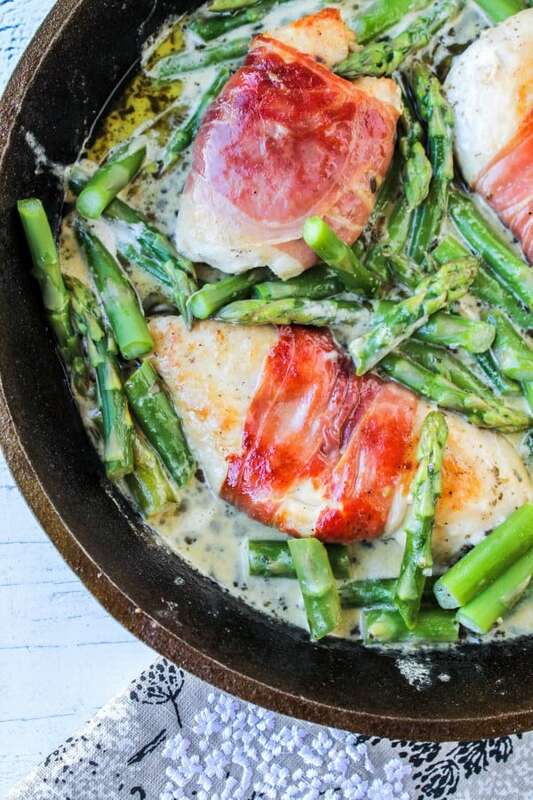 Prosciutto-Wrapped Chicken with Asparagus << this is a huge reader favorite! 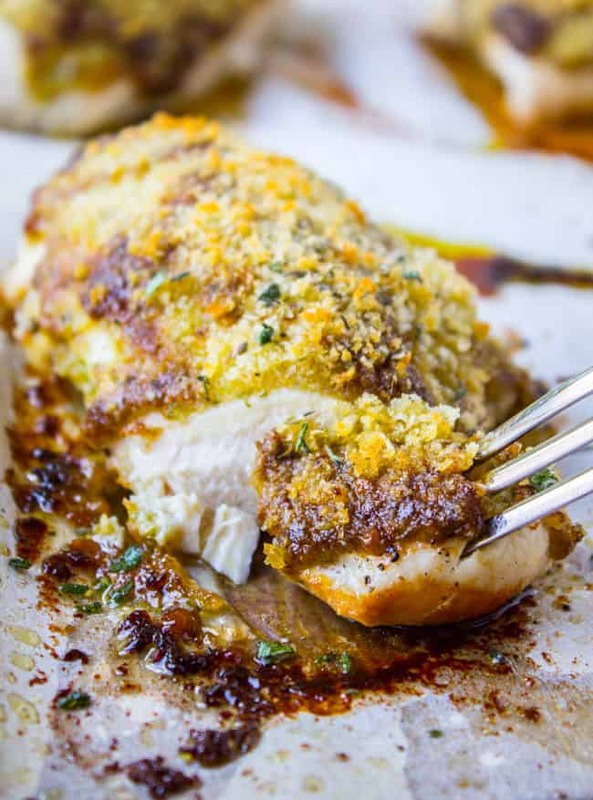 Easy Baked Pesto Chicken << this is a super quick weeknight meal. Garlic Lime Chicken << another super easy recipe from the archives. More chicken recipes from friends! COMMENTS! There are a few comments below the recipe here, but if you are actually making this, check out THIS PIN for more reviews. 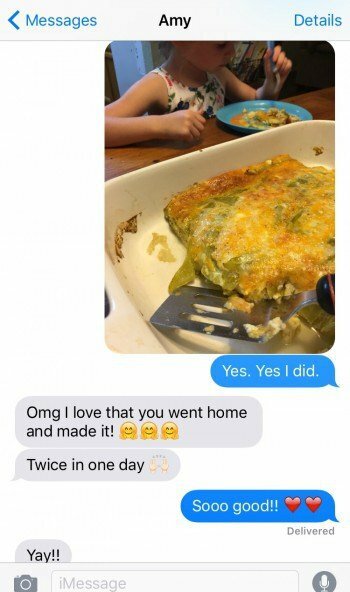 You can see comments on Pinterest from people who actually tried this recipe. I wish people would come to the blog to make these comments (it would be so much easier to find!) but I don’t want you guys to miss out on more info and reviews. Hi Jess, I don’t provide nutrition information, but you can always plug the recipe into an online calculator if you like! Very nice! I love everything about this meal! Thanks Mimi!! Love easy fall dinners! Hey Laura! You can substitute any kind of flour, like almond or coconut flour, or you can just skip it. The chicken will still sear just fine! Great question. There is a Facebook page that is using your photo and claiming they have the “paleo” recipe if you buy there book. I suggest reporting them, it’s called The Paleo Recipe Cookbook – Cheap and Easy. Hmm interesting I’ll look into it Renee, thank you! How long do you leave the chicken in the oven after you sear it on the stove? Hey Katie! The chicken is cooked completely in the skillet. You’re putting it in the oven just to keep it warm while you finish the other steps. Hope this helps! You can see comments on Pinterest from people who actually tried this recipe. I wish people would come to the blog to make these comments (it would be so much easier to find!) but I don’t want you guys to miss out on more info and reviews. I made this for dinner tonight using broccoli instead of broccolini. We loved the flavor of the sauce! Great recipe, thanks so much. Awesome Crissy! I haven’t tried it with broccoli yet but I’m sure I will eventually because I have that on hand way more often than broccolini. Thanks for testing it for me! :) And thanks for the feedback! This chicken looks really good. 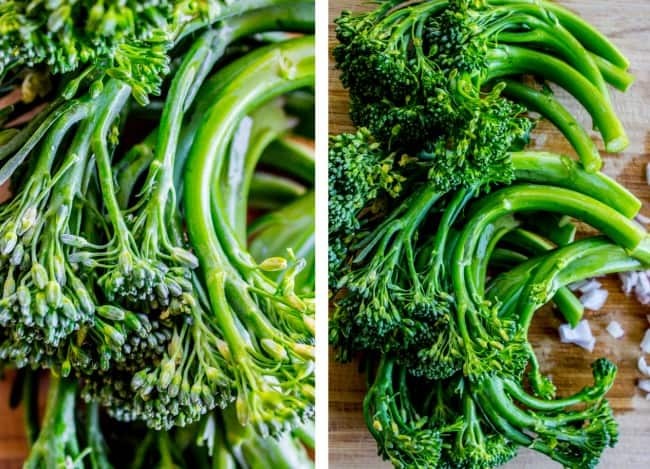 I love broccoli, how similar is broccolini? Haha!! That’s how I feel too, king size at least! And if you love broccoli you will love broccolini. It has a similar flavor but is a little more mild. Do it! Dude. You flatter me with your awesome words and pictures about the cookbook, thank you!! I still love that you went home after the shower and made that casserole…never get enough of a good thing, right? And you are the cutest pregnant women. Ever. Even if you don’t feel like it! You look so cute! What a beautiful pregnant lady you are. 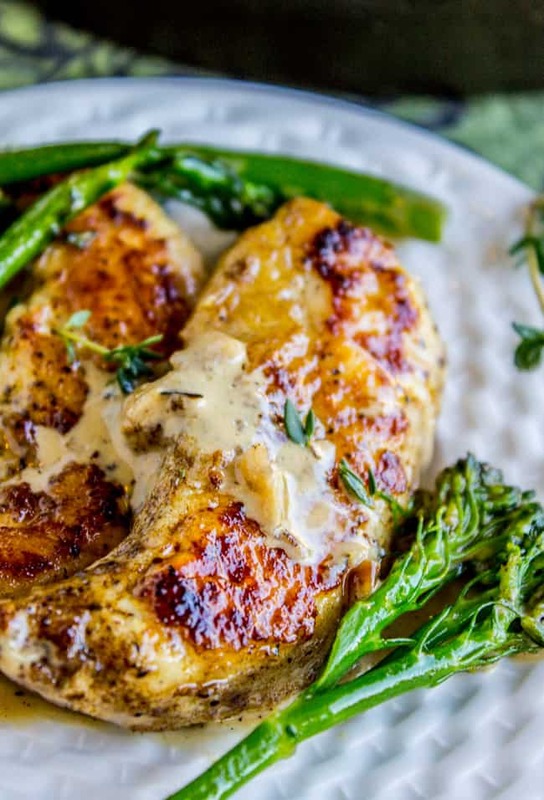 This quick dinner looks so creamy and satisfying! Awesome sauce!😀 The whole cookbook sounds amazing too. Awesome sauce is exactly right!! Haha. Hard to beat cream sauce, seriously.